I got to visit with some of my extended family recently, and it just reminds me of how much I miss them! I saw parents, cousins, siblings and friends last weekend, it was a blast! We got to just sit together, chat, catch up on what everyone is doing, and enjoy each other’s company. Of course, with a get together like this, food had to be involved. 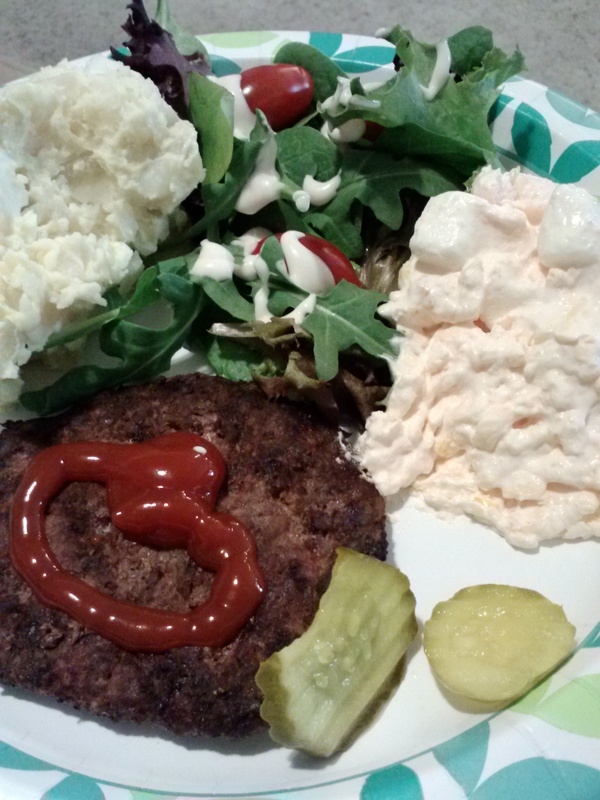 We grilled hot-dogs and hamburgers, had potato salad, green salad and orange fluff jello salad. Earlier that day, I had helped my mom make the orange fluff, and remembered making it a ton with her over the years. It’s one of those recipes that whenever I eat it, I think of family, and very specifically of my mom. I’ve said before how important our families and traditions are to me. So often those traditions revolve around food. But it still amazes me how many of my memories associate specific foods with specific people. Cracking nuts is associated with my grandparents on my dad’s side, while tamales are my grandparents on my mom’s side. I have an aunt I associate trifle with, particularly strawberry and angel food cake trifle. My father-in-law is stuffing. Grilled trout is my dad. And this orange fluff salad is my mom. Sometimes recipes are family secrets. It took my husband about 5 years of trying to get the stuffing recipe out of his dad. It wasn’t particularly a secret, we just had to sit down with him and write it because it was something he had only in his memory. We didn’t want it to die with him! While this recipe isn’t nearly as secret as that, I had forgotten a little about it until she asked me to help her with it. As soon as she mentioned it, I remembered making it as a little girl (it’s super easy), and had to smile at the memories. I’m so lucky that many of my family memories are happy. While we have our ups and downs, we get along and enjoy seeing each other. I hope you find some favorite family recipe, share it with some people, and just enjoy being together! This fluffy, sweet salad is a perfect side for those summer picnics! 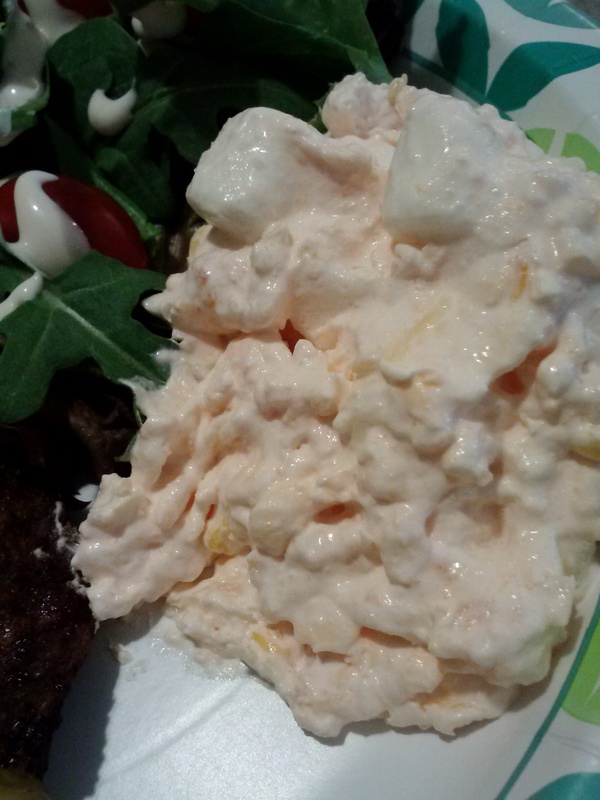 In large bowl, mix together orange jello and cottage cheese until jello has dissolved and no longer gritty. Gently stir in the cool whip until well combined. Add oranges, pineapple, and marshmallows. Stir again until evenly distributed. Cover and refrigerate for at least an hour before serving. Refrigerate leftovers, if you have any. This lasts a couple days in the fridge, but is best the first day or so.